In the annals of what must be one of the most ridiculous data security incidents, a law firm employee sent a client file on an unencrypted thumb drive in the mail. The file contained Social Security information and other financial data. The envelope arrived without the USB drive. The firm contacted the post office. The General Data Protection Regulation (GDPR) is one of the world’s strictest data privacy laws and requires privacy professionals around the globe to design and implement comprehensive compliance programs. In the past year, I developed a series of resources and training courses to assist privacy professionals with this complex task. 200+ pages of the GDPR summarized into 1 page! Download it for free here. This one page visual summary of GDPR will help you and your workforce understand many of the key elements associated with this law including Territorial Scope, Lawful Processing, Rights of Data Subjects, Enforcement and more. The GDPR Interactive Whiteboard adds a new level of engagement to the analog GDPR Whiteboard. and can be used in tandem with the analog version or in lieu of it. A Guide to GDPR Training will answer many of your questions about implementing workforce privacy awareness training. role-based training specific to an individual’s job function. I have several training courses to help organizations meet the GDPR requirements, such as the ones below plus courses on Privacy by Design, vendor management, risk and trust, and other important privacy topics. This course provides an overview of the GDPR. It also explains the importance of GDPR compliance and the severe penalties that may be imposed for non-compliance. It is suitable for both lawyers and non-lawyers . This course can also be offered in conjunction with other courses in our series – Privacy Shield and European Union Privacy Law. How do we protect privacy? Please check out our humorous 1-minute video vignette about the GDPR. Last year, major incidents involving law firm data breaches brought attention to the weaknesses within law firm data security and the need for more effective plans and preparation. An American Bar Association (ABA) survey reveals that 26% of firms (with more than 500 attorneys) experienced some sort of data breach in 2016, up from 23% in 2015. There is a significant degree of confusion and lack of awareness about attorney confidentiality and cybersecurity obligations. This issue is especially acute when it comes to using the cloud to store privileged documents. A common myth is that storing privileged documents in the cloud is a breach of attorney-client confidentiality. In other instances, many attorneys and firms are not paying sufficient attention to their obligation to protect the confidentiality and security of the client data they maintain. 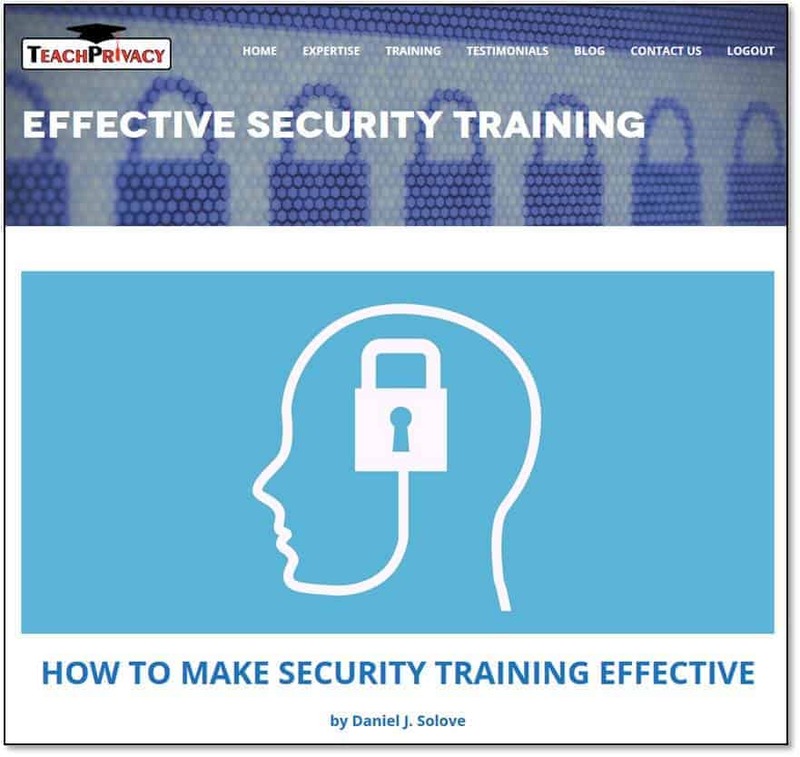 I recently created a new resource page — How to Make Security Training Effective. The page contains my advice for how to make security training memorable and effective in changing behavior. What laws require security awareness training? What topics do the laws require to be covered? What should be covered? How frequently should training be given? I recently created a new resource page — Security Awareness Training FAQ — to answer the above questions and more. I discuss various legal and industry requirements for security awareness training. I also discuss best practices. I hope that you find this resource to be useful. Should the FTC Kill the Password? A popular way some organizations are raising awareness about phishing is by engaging in simulated phishing exercises of their workforce. Such simulated phishing can be beneficial, but there are some potential pitfalls and also important things to do to ensure that it is effective. Think about the data that you gather about employee performance on simulated phishing. It can be easy to overlook the implications of maintaining and using this data. I look at it through the lens of its privacy risks. This is personal data that can be quite embarrassing to people — and potentially have reputational and career consequences. How long will the data be kept? What will be done with it? How securely will it be kept? What if it were compromised and publicized online? The Payment Card Industry (PCI) Security Standards Council recently released a helpful short guide to preventing phishing attacks. Merchants and any other organization that accepts payment cards most follow the PCI Data Security Standard (PCI DSS). One of the requirements of the PCI DSS is to train the workforce about how to properly collect, handle, and protect PCI data. A major threat to PCI data is phishing, with almost a third targeted at stealing financial data. Recently, the FTC issued a short guide to what organizations can do to protect data security. It is called Start with Security (HTML) — a PDF version is here. This document provides a very clear and straightforward discussion of 10 good information security measures. It uses examples from FTC cases. Free newsletter sent weekly about new writings, events, cases, developments, and training programs. Free newsletter sent 1 to 2 times per month about new writings, events, cases, developments, and training programs.